We are conducting a Pottery Workshop by Meeta Suraiya on Sunday 9th December 2018 from 11:00 am to 4:00 pm at Space 118, 118, Wadi Bunder Road, Opp. Copper Castle bldg., Near St. Mary’s School, Mazagaon, Mumbai-400010. For directions kindly see our website –http://space118.com/contact.html. A slider with the ID of 8 doesn't exist. 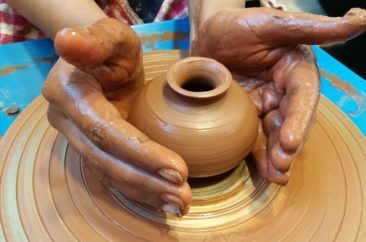 Meeta is a potter & sculptor with 10 years of experience running the creative institute, Meetakriti Pottery and Sculptures. She has a Bachelor in Fine Arts (Sculpting) from Rajasthan University (Gold medalist). Currently Meeta teaches sculpture in Oberoi International School to the primary section students as part of their ECA programme and at St. Dominic Savio High School in Mumbai, to the students of the secondary section as part of their curriculum. Meetakriti Institute has been conducting pottery and sculpting workshops for schools and corporates for both kids and adults. The workshop will start with a brief introduction about pottery (history, present and future), the materials being used and their significance and benefits. Instructions about basic terracotta pottery and sculpting techniques will be given. Each participant will get 4 turns on the pottery wheel, while others may continue with sculpting the articles. Each participant will be entitled to a maximum of 4 articles (including pottery and sculpting). The articles will be given back to the participants on the same day at the end of the workshop. Open to all from the age 15 and above. No prior experience is necessary in the subject or in any related art skill. The participant should not be pregnant. Since we have limited seats we will confirm your spot only after receiving the payment for this workshop by 6TH DEC, 2018. Fees cannot be refunded once the payment is made. However, in case a workshop is cancelled by Space118, the money shall be fully refunded. If the workshop is rescheduled due to unforeseen circumstances the money shall be allocated to the new workshop or fully refunded if the rescheduled date doesn’t suit the participant.